In the past month I’ve been getting notifications from Google that the mobile rankings of some of my client’s websites would be affected due to their inability to display properly on mobile devices. This informative article that I discovered via MOZ’s weekly newsletter, states that as of April 21, 2015, Google will make ‘mobile-friendly’ a ranking signal. This means that if your website doesn’t display well on mobile, according to Google’s criteria, your website will rank lower on mobile search requests. With 25-50% of users on mobile devices (depending on the industry and demographic of users), this could seriously affect web traffic on a previously well-optimized website. Wondering how your website will fare with this algorithm update? 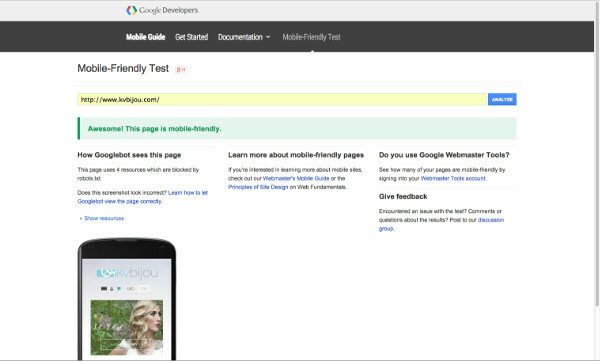 The Google Developers site provides feedback on if you website is mobile-friendly or not. Simply type in the URL of your website and it will return a screenshot of how your site displays on a phone, along with the mobile-friendly response. With a limited budget, it might make sense to make the highest traffic pages on your website mobile-friendly, as a short-term solution. This can be achieved by plugins or template sets that are optimized for mobile. This may be a good option for high-traffic e-commerce websites but for most this is not the most effective or cost-effective solution. If it’s been more than 3 years since the last website build, this option makes the most sense. Most companies or organizations could use a content or brand refresh within that timeframe. With the growing trend towards mobile and tablet use, a website optimized for all devices (mobile, tablet & desktop) makes the most sense from a brand, user experience and long-term budgeting perspective. Let me know your thoughts below. If you need more information or are interested in learning more about your options, we invite you to get in touch.